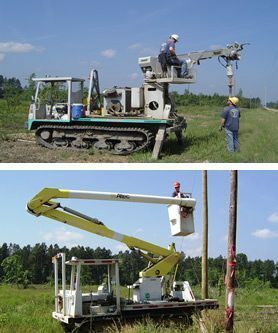 The Construction Department of Arkansas Electric Cooperatives, Inc., (AECI), has served Arkansas’ electric cooperatives, as well as other electric utilities, since 1966. The department builds electric distribution and transmission lines and substations for its customers. The department’s crews also move power lines and poles when roads are widened. In emergency situations following storms, the department provides crews and equipment to assist with clean-up efforts and repairs.